In 1615 James Macdonald of Islay, beginning what was to be the final chapter in the Macdonalds’ struggle against the rule of England and Scottish surrogate rulers, escaped from Edinburgh castle to fight one last time with the clans against the crown. Among the clans he gathered to his cause were the Macfies of Colonsay under their chief Malcolm. Late in the year Colla Ciotach MacDonald,or Colkitto (a Macdonald who had secretly joined the forces of the crown under the Earl of Argyll), betrayed Malcolm Macfie. Malcolm was forced to give up the clan’s hereditary right to rule Colonsay. For a few years Malcolm remained on Colonsay, but it must have been a strange existence. In 1623, as colonists were unwittingly founding a new nation in Massachussetts, Malcolm Macfie was killed by Colkitto on Colonsay, bringing an end to the little island nation of the Macfies. The Macfies gradually dispersed from Colonsay over the following generations. This, then, is the backstory to the tune The Rout of the MacPhees. The tune is on the list of Silver Medal tunes from the Piobaireachd Society for 2008 and thus stands a reasonable chance of being heard during this competition year. Still, it is probably not a first choice of pipers given that it is not as “tuneful” as others. I’m not sure who wrote the tune – if it was a Macfie, a Macdonald, or some other person. Knowing this might help to understand the tune a little better, but in the meantime I am choosing to interpret the tune as one of those “angry” tunes which appear occasionally in the repertoire. At the recent Winter Storm competition in Kansas City only one competitor played the tune out of a field of nearly 30. But one is better than none, and we can be grateful for Captain Ken Eller’s omnipresent recording device. Visit The Captain’s Corner and scroll down to enjoy David McNally’s performance of The Rout of the MacPhees, the first recording available of this tune in recent years. Thank you David for choosing to spend some time with this tune – this Macfie appreciates your efforts. Because this wonderful tune is on the Piobaireachd Society’s Silver Medal Tune List for 2008, I have a feeling we will be hearing a lot of it this year. Alex Gandy (Bruce Gandy’s son) played it at the Winter Storm competition in Kansas City a couple of weeks ago. You can hear Alex’s performance courtesy of The Captain, Ken Eller, on his website. Alex was second in the Silver Medal ceol mor with this performance. Also, you can listen to (and watch) new arrival to the United States, Dave Mason, play the tune on YouTube. He has posted his performance for EUSPBA grading purposes, but has given me permission to link to it. Allan MacDonald has already brought his talent to bear on his interpretation of the tune on his new CD Dastirum. Now we can hear how (slightly) lesser mortals play it. Something Blue? Winter Storm Piobaireachd. Well, I guess it’s a stretch, but I had this literary device hanging over me, so I decided to use part of it right away. Two weeks ago the Midwest Highland Arts Fund held their Annual Winter Storm Weekend, an indoor piping and drumming competition. 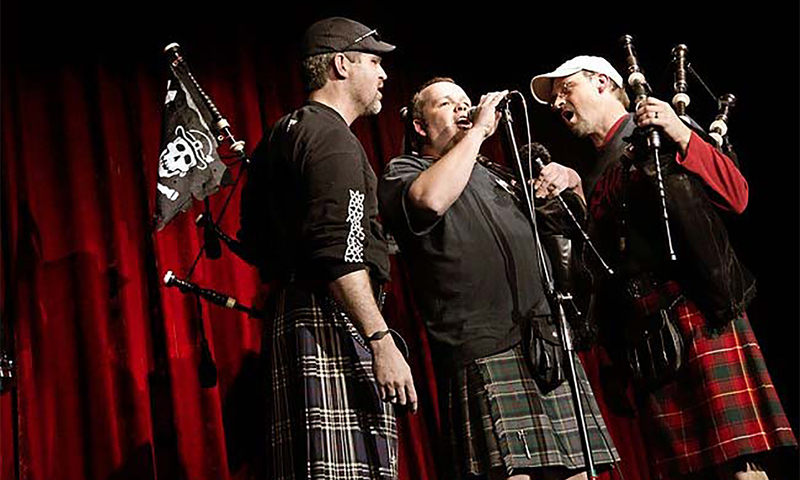 The competition draws top pipers from across North America and even a few overseas competitors. The judging panel is drawn from the World’s top pipers and many other distinguished players show up to perform at the big concert and give workshops. Angus MacColl is a regular in Kansas City and others you can expect to find in town include Alasdair Gillies, Mike Cusack, Willie McCallum, Andrew Wright, Fred Morrison, and so the list goes on – you get the idea. The performers in the Gold and Silver Medal competitions played tunes from the respective 2008 Piobaireachd Society set tune lists, the first outings for these tunes this year. A few recordings of the proceedings are now available. Go to Ken Eller’s Captain’s Corner site for the prize winning tunes. Ken was MC for the events and also made recordings. In addition, a couple of the performances have shown up on YouTube. I particularly enjoyed Donald MacPhee’s performance of The Clan MacNab’s Salute. This is not a tune I knew before, but I have listened to it several times now and it’s really growing on me. You have to listen in two parts, but it’s still worth the effort. I hope there were some people there with professional sound equipment, since it would be good if some of the piping radio shows would carry these performances. In any case, enjoy the tunes! A couple of months ago I wrote about an incipient new piobaireachd resource I had discovered while speculatively trawling the web – a site of performance downloads from Roddy MacLeod, M.B.E. Roddy is one of the World’s top pipers and is the Principal of the National Piping Centre in Glasgow. His piobaireachd site is now up and running, with a great list of big tunes for download. His performances are always a joy to listen to, and this site makes available performances, together with music scores and canntaireachd, so it becomes a useful teaching resource. Like the teaching recordings of his namesake, Donald, I think this will become a beneficial resource for all pipers interested in piobaireachd. …just to get you started! The Angus MacKay MS dates from the 1830’s and it alone contains almost 200 tunes. I have only just begun to explore the contents of these old manuscripts, but I’m sure it will repay the effort. There are tunes I have never heard of and that are rarely played – it’s great that these tunes will most likely become an active part of the repertoire once more. At this point I have access to over 100 different piobaireachd tunes, gleaned from various sources – many freely available on the web. I have decided to spend some quality time with a few of the tunes for which I have multiple performances, to get a handle on how different pipers interpret the tunes. Ken Eller, on his estimable site “The Captain’s Corner”, has made available many recordings of recitals and performances he has attended over the past two years or so, and it is from his archives that I draw my two examples for today. “The Old Men of the Shells” is one of those intriguingly titled tunes that just begs an explanation. Two possible backstories are given at the end Dr. William Donaldson’s article on the tune, which is part of his excellent series on Andrew Berthoff’s Pipes|Drums website. Whichever story you believe, the tune apparently commemorates a series of reciprocal deaths by drowning, hence the allusion to prolonged life among the creatures of the sea bed. As far as the tune is concerned, the various manuscript versions available are nicely discussed in the Donaldson article, but whichever path you take through the tune it is a very beautiful and lyrical one. This beauty is heightened in the thumb variation of the urlar, which swoops across the entire register of the bagpipe – very dramatic! I mentioned earlier, two recordings are available on The Captain’s Corner website. Listen first to Lionel Tupman playing the tune at the William Livingstone Memorial Invitational Competition in 2007 and then to Andrew Hayes playing at the same competition one year earlier. Both performers take the same route through the tune, but Tupman plays the tune at a considerably slower pace. I thought that the juxtaposition of these two tempi was interesting, and I invite your comments. I will not tell you which tempo I preferred, but either way, enjoy the tune – it’s a classic! Lost – several pibrochs. If found, please return to the present. The Bob Dunsire Forums are a mine of interesting information, beyond being a simple meeting place for pipers and drummers. I recently started a discussion thread at the forums asking for more information about “The Lost Pibroch”, the story I wrote about last month. That thread has been the scene of some interesting discussion and today one of the forum members has spliced it with another thread dealing with the current state of piobaireachd composition. It appears that, whether or not the Neil Munro short story is based in fact, there are a number of lost piobaireachds out there. These are tunes referred to in various places (obituaries, journals, etc.) but for which no manuscripts are currently available. The composers of such tunes include such piping illuminati as John MacColl and Angus Lawrie. The enterprising forum member has put out a call to compile as many piobaireachds as possible that have been written in the past 100 years or so. I think it may be time to contact Bob McFie again, since he has a tune which could reasonably be added to this list. In addition, one of the “lost” tunes by John MacColl is a “Lament for Donald MacPhee”, and you know I’m not going to let that one lie! Lovers of piobaireachd should definitely check out BBC Radio Scotland’s Pipeline show this week. The star of the show this week (10th November, 2007) is a beautiful performance of a tune that actually has no name. I suppose this is an artifact of oral transmission, but many tunes in the ancient piobaireachd canon have come down to us with no name. When this has happened the tunes are left designated as “Nameless”, although the first few canntaireachd vocables are usually attached to the designation. In the case of the tune played on Pipeline this week, the tune shows up in only one manuscript source – Colin Mor Campbell’s Nether Lorn canntaireachd – and is usually referred to by those vocables, “Cherede Darievea”. Cherede Darievea is one of the very long tunes in the repertoire. Iain Speirs is the performer this week, the recording having been taken from the recent Glenfiddich Piping Championships. He keeps a good level of forward momentum in the tune, but even so he comes in at a little under 19 minutes. With the nameless tunes one wonders what they might once have been called. Still, even deprived of a back story, Cherede Darievea has a lyrical and haunting melody and Iain Speirs’ performance and beautifully set-up bagpipe are a delight to listen to. The show switches editions on Saturday evenings so you still have a couple of days to listen. The tune is not often played, so be sure not to miss this rare treat. I’m not sure if this is old news, but today I came across an incipient website from Roddy MacLeod, M.B.E., the principal of the National Piping Centre in Scotland. I was talking to a loyal reader of my site just the other day who mentioned (in reference to my frequent posts on piobaireachd) that she “didn’t have a clue what I was talking about”! So, for those of you who may not be as oddly focussed on this arcane subject as I am, I have prepared a new section of permanent pages to guide you. I’ll continue to edit these pages and add some illuminating links, but for now I hope they are of some help. Piobaireachd stories – no joking matter! When I wrote about Peg Kingman’s new novel “Not Yet Drown’d” earlier this month I created a new category, to include it and the Cynthia Thayer novel “A Certain Slant of Light”, since I could hardly believe that there would be more than one novel written about piobaireachd. Turns out I should remove my tongue from my cheek. I have discovered another story about piobaireachd, this one from 1896. At this point I can only assume that what I thought would be a joke category is likely to be used some more in the future. This story is called “The Lost Pibroch” by Neil Munro, and is the title story from a collection of short stories involving life in the Scottish Highlands. Munro grew up in the Highlands but, like so many others of his generation, left for the big city when he was barely 18. By the time he was 23 he was Chief Reporter at the Glasgow Evening News. His first successful attempt at writing fiction was the set of short stories that are the subject of this post, and after their success he scaled back his journalism and focussed on fiction for the rest of his life. He was under-appreciated in the years following his death in 1930, as his career coincided with a proliferation of over-romanticized Scottish fiction, but it has been suggested more recently that he was to some extent satirizing that same genre. “The Lost Pibroch” seems to bear that out. More gothic than romantic, it turns about the playing of a tune that only a handful of pipers are ever able to (or should ever) play. I will not give away the plot, but the playing of the tune has unforseen consequences that appear to be in evidence in some of the later stories in the collection. If you live in North America you can download the whole volume and start reading, using Google Books. Apparently, this will not work for you outside North America (possibly because of copyright restrictions) so you will have to scour your local bookshops and libraries. Good luck!